It all began in Paris during the 1960's. The French capital was the leader of the European cultural and economic renaissance, the land of inspiration and passion. The stars of the new revolution of style get together at Café des Anglais, the Palladium and in the local Montmartre spots. "Salut les Copains" is a radio program dedicated to the artists of Boulevard Saint Michel that anticipated the fashion and lifestyles of the times. The brand name is dedicated to that unique, unrepeatable atmosphere. Knitwear takes the stage and is put in the spot light. It no longer has a simply traditional and functional role, but it assumes a noble, more fascinating aspect. The production is now infl uenced by the ideas of the Prét-à-Porter designers. Les Copains blends the colours of art with the most innovative technologies, it creates atypical practices and turns them into novelties. The Knitwear revolution is completed. Global knitwear takes its first steps and Les Copains sets sail to conquer the world. 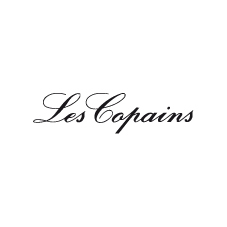 The Les Copains brand is appreciated worldwide and its personality is unparalleled. Various cooperations with important designers (Chloè, Albini, Versace, Mugler...) give the brand an importance that stands the test of time. The Bologna atelier mixes attitude with creativity, the experience of knitters and the skills of tailors, providing a 360° vision on the world of fashion. The designers' creations begin showing on the Milan catwalks, soon becoming one of the stars of the Made in Italy fashion scene. Knitwear in cashmere will always remain Les Copains first love, even as the brand has evolved through the years. Les Copains maintains its high standard of quality by investing in research, superior production techniques, innovation and technological development. Attention to creativity, details and refined materials, as well as the ability to respond to consumer needs, quickly and effi ciently, are all distinctive characteristics of the brand.